I am Distinct and I am All, I am Ambivalent. And I Breathe in My Work, being both the Whole and the Fraction. I Am in the brain and in the heart, because I Am the Lord. And marching towards the Truth, you will destroy your crosses. You will grow in My Matters, in order to have My Glories. Above any simulations, glorifying in Me the Eternal Life. And united with Me you will have, in Me, Glory and Freedom. Children who are My collaborators, by the Union of Our Minds. The Ten Commandments are the intellectual reflection of the Law of Equilibrium, or Cause and Effect. 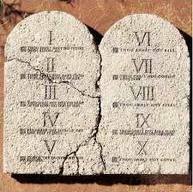 To revoke the Ten Commandments, The Universal Equilibrium would have to end. The Law of God contains the Entire Doctrine, in theory and in practice, because the same Jesus, who following the Father’s orders passed it on, later came to experience it among His protected ones, so that the Law could be known in theory and in practice and fully available to all children of God. 1- I am the Lord your God, there is no other God. 2- Thou shall not make any images to adore. 3- Thou shall not utter the name of God in vain. 4- Thou shall have a day in the week for resting and contemplation. 5- Thou shall honor father and mother. 6- Thou shall not kill. 7- Thou shall not commit adultery. 8- Thou shall not steal. 9- Thou shall not bear false testimony. 10- Thou shall not covet what is thy neighbor’s. The pages on this website (with the exception of “Divinism in History” and “Who is Osvaldo Polidoro?”) were compiled from the works of Osvaldo Polidoro – the reincarnation of Allan Kardec. It should be stressed that the true meaning of DIVINISM can only be found in the works of Osvaldo Polidoro (and inside each individual), therefore, reading these pages does not dispense with reading his works, which are available free on this website, from the “Downloads” section. PRAYER is a way of penetrating with the MIND the higher planes of LIFE to harvest and then distribute, even after extracting great advantages from it. In this section the reader () will find answers for the questions most frequent, on the subjects: Divinismo, Osvaldo Polidoro, Apocalypse, Jesus among others. THE PRINCIPLE OR GOD - Omnipresent, Omniscient and Omnipotent Divine Essence, the origin, foundation and end of all things, and whose destiny is the Total Reintegration. The Spirit and Matter, the Worlds and Humanities, and the Relative Laws shall return to the Essential Unity, or Spirit and Truth. If it stopped Emanating or Manifesting there would be nothing but It, the Omnipresent Principle. Since the Principle is Whole, it doesn’t grow or diminish, everything revolves around being The One Who Manifests or The Manifestation, Manifesting all things and Reintegrating all things. That is the Divine Monism. SPIRIT CHILD - The sparks, which are emanated and not created, contain ALL POTENTIAL DIVINE VIRTUES, and must blossom them in the bosom of the Worlds, of the incarnate and the discarnate, until they return to the Divine Bosom as One or Spirit and Truth. No one will be a child of God forever; all shall be God in God. This wisdom was taught by Hermes, Krishna and Pythagoras. Jesus lived the Unmistakable Character of EXEMPLARY Verb, of everything that derives from the ESSENTIAL ONE and to It shall return as a TOTAL UNIT. The Empty Tomb means more than the Manger. (Understand this well). THE CAR OF THE SOUL OR PERISPIRIT - It is formed so the spirit child can interact in the Cosmos, or Matter. The self-divinization of the spirit, that is, when it reaches the Divine Unity, or Reintegration, is the end of the task of the perispirit. Self-divinization or, in other words, the blossoming of the Latent Divine Virtues, happens extremely slowly. Everything increases in Light and Glory until it becomes Total Divinity, Total Union, i.e., its RELATIVITY decreases and DIVINITY increases. MATTER OR COSMOS - Matter is Divine Essence, Divine Light, Energy, Ether, Substance, Gas, Vapor, Liquid, Solid. It is the tool of the spirit child of God in any shape or form. (Those who do not seek to understand that are very unfortunate). Actually, his return to the flesh goes back to well-known prophecy made by Jesus when, two thousand years ago, he warned the Hebrews, who were kept simple, illiterate and spiritually immature by the clergy at the time, “I have many things to tell you, but you cannot bear them now” (because they were not capable of understanding) and “Elijah is to come and He is to restore all things”. Thus, complying with what had been determined by God, and in agreement with the news in “Posthumous Work” (Allan Kardec), He reincarnated on June 5, 1910, under the name OSVALDO POLIDORO, in the city He had helped found when He was José de Anchieta. His main work, the BOOK of all books: EVERLASTING GOSPEL AND PRODIGIOUS PRAYERS – prophesized in the Apocalypse 14, 6 (“And I saw another angel flying through the midst of heaven, having the Everlasting Gospel, to preach unto them that sit upon the Earth and over every nation and tribe and tongue and people”) – is already available, and can be found at major bookshops..
What are the Fundamental Divine Truths? What do you know about: the Principle or God; Its Unpolluted Justice, Its Gifts of the Holy Spirit or Mediumship distributed to Its Children; and Its Ten Commandments, and Its Angels or Messenger Spirits who deliver teachings and graces? What did Jesus teach about the Law of God, the 10 Commandments? What did Jesus say to the priests? Excerpts of the Bible and the Great Initiates. A reference book to all those eager for fundamental knowledge. All Great Revelations are addressed. The precursors of Unmistakable Christ, all of them shown in transcribed and commented texts, transformed into a real spread of vibrant emancipating Truths. It is the book that fills the gap that shows that Spiritualism is the Final Revelation, given that it was delivered to Humanity by the Revealing Instrument itself. The Christ of God presented live so that Spiritism may be finally understood .